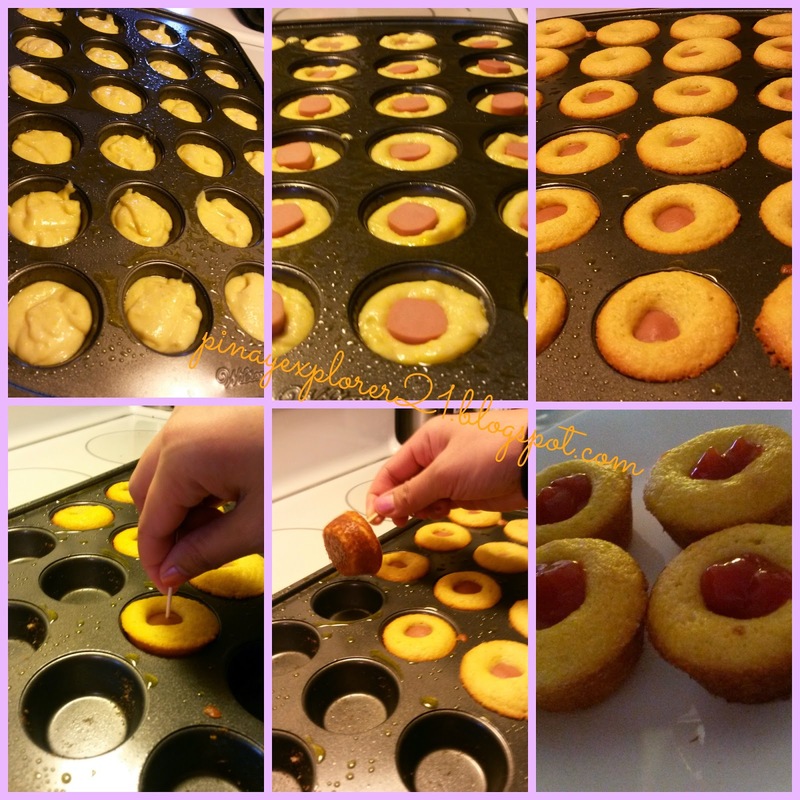 I'm pretty sure your kids will going to love this honey mini corn dog muffins. 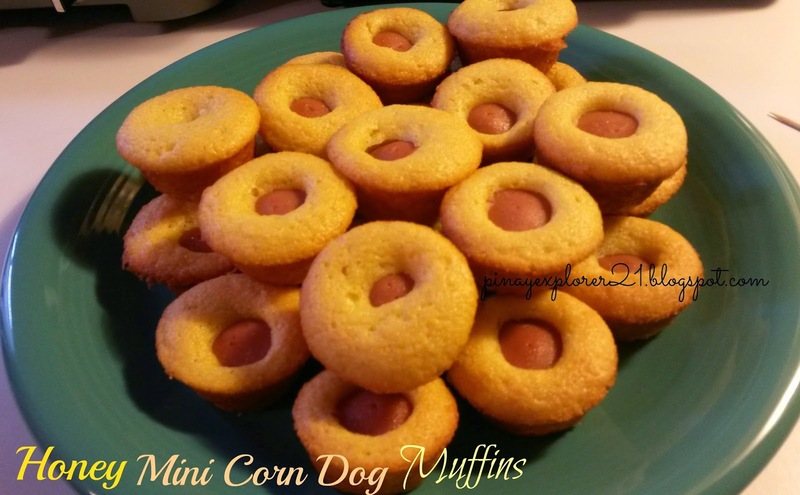 My kids LOVE them and always ask when we are going to have corn dog muffin again ( hahah)...and if your looking for a super easy appetizer for any parties or get together, this recipe is perfect for you. Before I forgot, the corn muffin mix is store bought, So, you don't have to worry about mixing and measuring for corn muffin mix. It is perfect every time, promise!. Just simple follow the direction on the back of the package, add HONEY and.. Viola! DONE! Just bake it 10-12 minutes at 350 degrees. The excitement of my kiddies face watching the oven is priceless. A moment to be treasure for the rest of my life. Join me in my kitchen as we make the perfect Honey Mini Corn Dog Muffins. 1.) Cut the hotdogs into 1 to 1 1/2 inches about 24 pieces. Set aside. 2.) 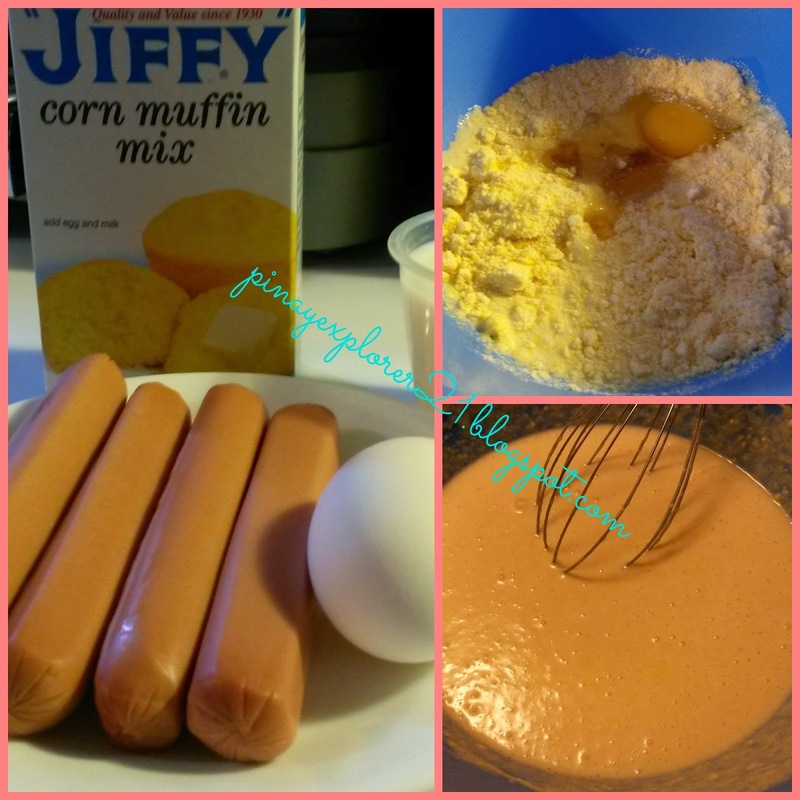 In large bowl combine one pack of Jiffy corn muffin mix. Add one egg, milk and honey. Stir until everything is combine. 3.) Spray the mini muffin tin with non-stick cooking spray. Add a spoonful of a mixture or until halfway through the tin. Put the cut hotdogs into the middle of the mixture. 4.) Bake on 350 preheated oven for about 10-12 minutes or until golden brown. -One package of Corn Muffin mix is only good for 24 mini muffin. Double the ingredients for larger crowd. - Add more honey if you want it little sweeter or adjust the ingredients according to your taste preference. These look awesome!! I want to dip them in mustard. looks yummy, kids will love this! I'm using big oven, but you can totally give it a try on microwave oven I think. Thanks! I can almost imagine how good this smells. Hmmm yummy! Heading to your blog. Thanks! looks delicious!! now I miss the corn muffins that my sister bakes while I was living with her in the US. I bet it is delicious. Wish you could make some:) Thanks! Looks very attractive especially to kids. This must be fun especially for kiddie parties! I'm totally with you..:) Kiddies love corn dogs:) Thanks! Super easy and fast. :) Thanks! Wow, they look great! They look like something I would devour on a cheat day hehe! Since I've never really tried baking corn dogs before, I'll keep this recipe in mind in case the baking bug strikes me again. This is such a keeper! super easy, fast and delicious:) Thanks! I would love to try this one if only there is a corn muffin mix sold in our grocery. Oops, I forgot that I have a busted oven. Ha! As usual, yummy recipe :) Naku sis, sana we can buy the oven the soonest so I can try those muffins. But we will buy the steamer daw muna mas mura haha. Looks great! I thiunk the kids would love that! I hope there's an oven toaster version. haha! My pamangkins will love this! I think you can also use cheese, bacon or ham instead of hotdog. They will be delighted to do this too! Aw! I would love to try this out, but I don't think I can find corn dog mix in our local groceries. Look for the Corn Muffin Mix Sis, It usually be found at baking aisle:) Thanks! That's an interesting recipe. I haven't tried making corn dogs for the kids yet :) They love hotdogs. Melgie, I wanna have this for meryenda, but I'm not eating meat for Lent!!! I miss hotdogs already. Those look perfect as finger food for a party. Delish too.